Greetings and Salutations Ham Radio Operators! 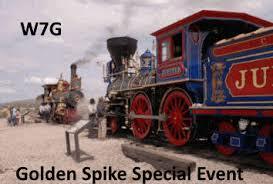 We are, once again, organizing the Golden Spike Anniversary Special Event Station, W7G. This year is especially Awesome, as it is the 150th Anniversary. The State, and even the Federal Government is getting involved! It’s gonna be big! We are looking for operators to sign up at either the Promontory location, Golden Spike National Historic Park, or at the Ogden Location, Union Station, “The Heritage Festival”! Don’t worry, lots to be had at both locations! Ogden will have “Big Boy”, No. 4014 and “Living Legend”, No. 844. Promontory will have their usual suspects, the Jupiter and the 119. You can find out more about this event, and sign up to operate the radios at either location, at W7G.org! Or just use one of the following links! More details will follow, keep watching W7G.org for details!